PHYLLIS HOPKINS has shared stages with many top tier blues artists through the course of her career. 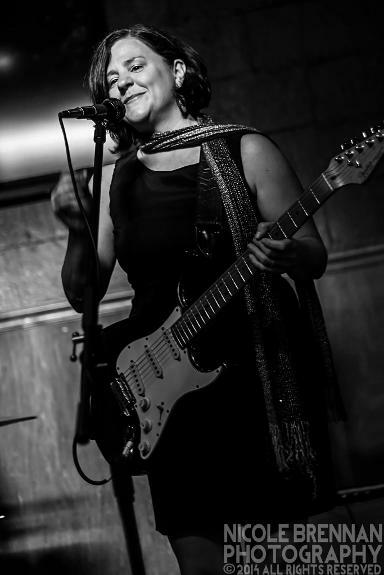 Known for her unique voice and fiery guitar solos, she has already released two independent CD's of her own music. Although the songs run the gamut from rock to quirky pop, the cornerstone of all of her work has been a deep love of blues. Most of her work is rooted in blues, regardless of where it may roam stylistically. You can hear healthy doses of Magic Sam and Ronnie Earl in her guitar playing. Her voice is dynamic, sometimes quiet, and demure, and other times, loud and forceful. Drummer JULIO CAPRARI'S was a member of Sting Ray's Blues Band. It was here that he met bassist NOLAN AYRES who was also part of Ray's band. After that group dissolved, it was a few years until the two would work together again, this time behind Phyllis. From their back bone shuffles, driving rock, and Latin styles to their slow dynamic rhythms; this trio has proved to be a perfect fit and were out playing almost immediately. The band works a steady schedule of club dates in the greater Northeastern, Pa areas, playing eclectic covers and originals. If you get an opportunity, check them out.